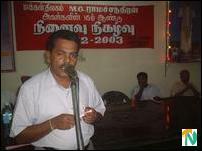 Mr.S.Ezhilan, the Vavuniya district political leader of the LTTE, is addressing the event. “Though MGR was a movie star, he did several good deeds for the people of Tamil Nadu when he was the Chief Minister. When our movement needed money, he gave us money out of his private funds. He fully recognized the need for our armed struggle. He never sought political gain through his support to our cause,” said Mr. Ezhilan. Mr. S. Gnanapragasam, the head of the organizing committee for the commemoration, presided over the event. “Sivaneri Puravalar” S. A. Ramaswamy, the head of the Vavuniya Hindu Association and a businessman, lit the traditional lamp. Businessman Mr. S. Kulendran unveiled a picture of MGR. Mr. K.A. Senthilnathan, the Vavuniya district head of the All Ceylon Tamil Congress (ACTC), Mr. Sivasakthi Anandan, MP, and many others present paid homage to the late leader by scattering flowers in front of his picture. Mr.N.Sivasathi Anandan, the TNA MP for Vanni district, addressing the meeting. In memory of MGR, Mr. Ramaswamy handed over a thousand exercise books to Mr. Ezhilan for distributing to poor students in the district. Continuing his speech, Mr. Ezhilan said, “It is common for liberation organizations to get financial support from a country or other external organizations. But our situation is different. We carry on our struggle with only the support of our people. “When our movement needed emergency funds in Mr.Ramachandran's time, he understood it and provided the funds. Even when he was seriously ill, he would inquire about the struggle of the Tamils of Eelam. For the Tamils of Eelam, his death was an irreparable loss. At that time, the current CM of Tamil Nadu, Ms. Jayalalitha Jayaram, who was with MGR, also supported his policies. But her policies toward us have changed now. 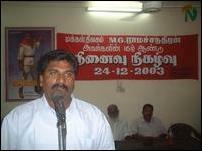 Mr. Anandan, the TNA MP, said in his speech, “India rendered immense help to Tamils of Eelam after the July 1983 pogroms in Sri Lanka until the Operation Liberation of the Sri Lanka Army in Vadamaradchi in 1987. Similarly, the late MGR helped the struggle immensely whenever the struggle needed his assistance.